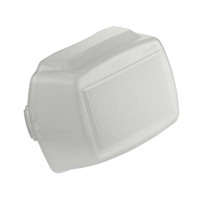 The replacement Nikon SW-13H Diffuser Dome attaches to flash head producing omni-directional diffused light. The diffusion dome works ideal with wide-angle lens but can be used alongside any lens. Reducing the effective range of the flash, the diffusion dome softens the light produced from the flash. The diffused light from the flash helps to lessen the glare and also lessens the harsh shadowing caused by an intense flash light.